New York, NY – March 28, 2018. 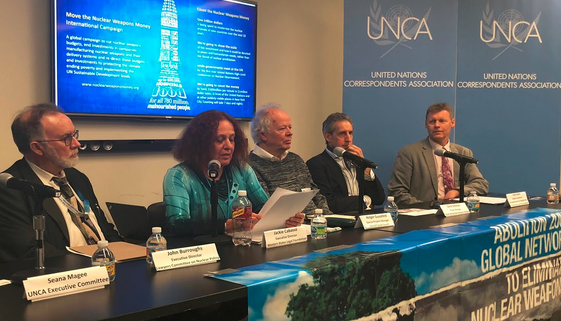 At a media briefing for journalists at the United Nations in New York today, nuclear disarmament experts and campaigners highlighted the critical need for successful diplomacy on nuclear-weapons related conflicts, including in Northeast Asia, between the US/NATO and Russia, and at the upcoming UN High-Level Conference on Nuclear Disarmament. “Putin’s March 1 speech and the February 2 U.S. Nuclear Posture Review make clear that Russia and the United States are poised to resume nuclear arms racing on a scale not seen since the dark days of the Cold War,” said John Burroughs, Executive Director of the Lawyers’ Committee on Nuclear Policy (USA) and UN Representative for the International Association of Lawyers Against Nuclear Arms. The UN High Level Conference on Nuclear Disarmament will convene in New York May 14 -16. Nuclear disarmament campaigners plan to use the occasion to focus public attention on the nuclear-weapons industry, a key stimulus to the nuclear arms race. “Companies manufacturing nuclear weapons and their delivery systems are a powerful lobby to increase nuclear weapons budgets, and to expand nuclear weapons policies in order to justify this massive public spending,” said Alyn Ware, Global Coordinator of Parliamentarians for Nuclear Nonproliferation and Disarmament.